Does your husband listen to everything you say? Let me just preface this by saying that I have a really great husband who supports me in all my endeavors and is sweet as pie. He just doesn’t listen!!!!!!!!!!!!!!!!!!!! I really believe that men’s ears do not hear all of the words put out there. Just too much for their XY brains to process. So…they get what they think is the gist, and fill in the rest. The problem for them is that 50% of the time they fill in the blank correctly, so they think that they are doing pretty darn good. Tonite, I was particularly irritated, as if the same phrase is repeated 3 times, you should be able to piece together an 8 word sentence properly. Perhaps I am asking for too much. Don’t even get me started on how they see color differently…. On a knitting note, I finished the STR Lenore socks. They are nice, and fit well. I extended the heel flap significantly beyond what the Yarn Harlot suggested. Maybe most sock knitting designers have flat feet. I don’t think that I would repeat the pattern, it wasn’t that exciting. Put in the “give-away” pile, which is growing ever larger. Just when I thought I was caught up, in the mail arrives a new package from STR. I suspect I was one of a few not looking to have this yet. I started working on the Lenore socks from last November. While the pattern is simplistic, I am finding that I like it, and I like the color. The irony is that that shipment totally turned me off to the sock club and the projects. Just goes to show that you can’t judge a sock by it’s pattern leaflet. 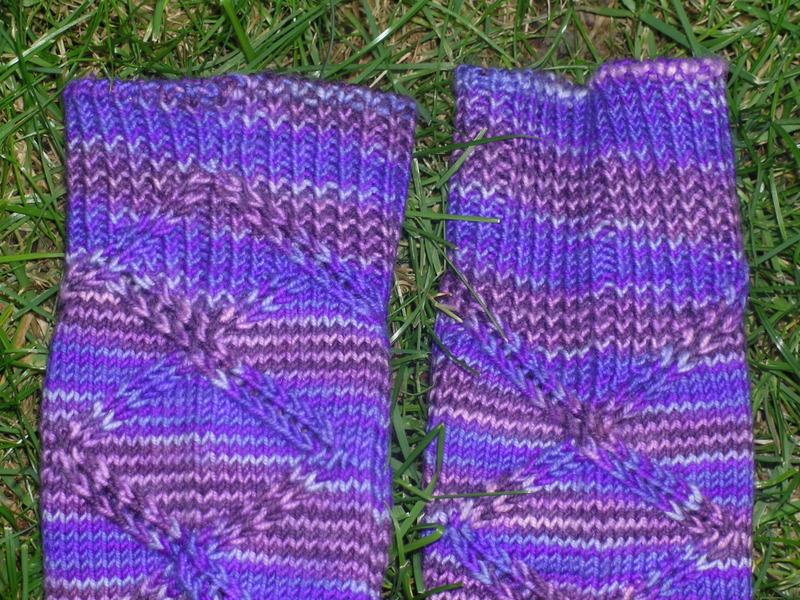 When I went on Ravelry to look at the Lenore sock, I found that those pictures were much better than what was on the pattern, and the color was more intriguing. 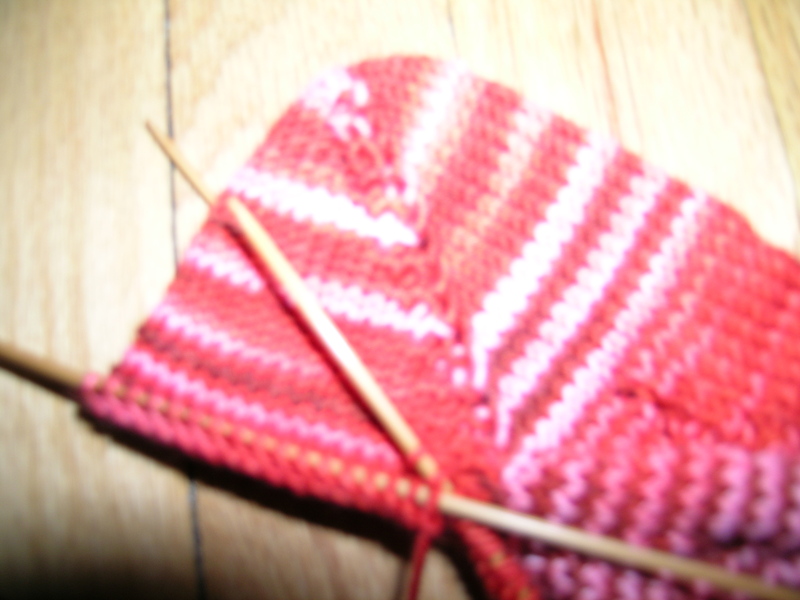 So, I am on my way on the first sock, and it is going nicely. I think that I might save it for travel and the more mindless times. The package that arrived yesterday contained a wonderfully colored palate of light brights. They called it pastel, but I am not sure that I agree. I think that this may be a yarn that I like in the hank better than knit up. it seems that they sometimes loose the look that I love when knitted up. We also got 2 patterns, one a more complicated one, with this shipment. I think that I will knit up the more complex one with this yarn. but I will use the easier pattern to make a pair of socks for my daughter. She does not like socks coming up high on her legs, so that might be perfect for her. I have been playing with how to best photograph my projects and yarn. When I zoom in on the items, I seem to loose detail, it is much better when I simply bring the lens closer. 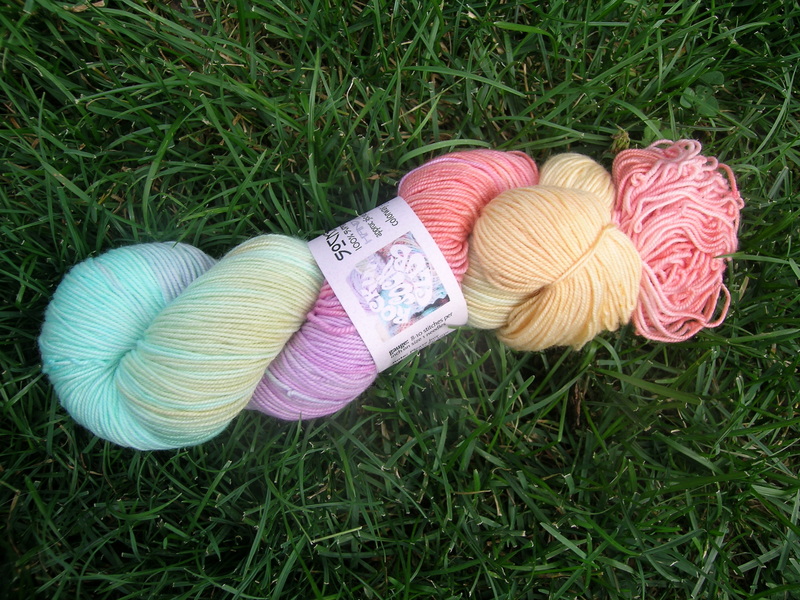 I have also discovered that all of my yarn and projects seem to look the best when photographed on the grass outside. I don’t get the reflection that I get off of wood inside, and have the beauty of the natural light. The color seem more accurate and saturated. Wonky socks was a description that I saw for these socks on Ravelry, and I think that it fits perfectly. 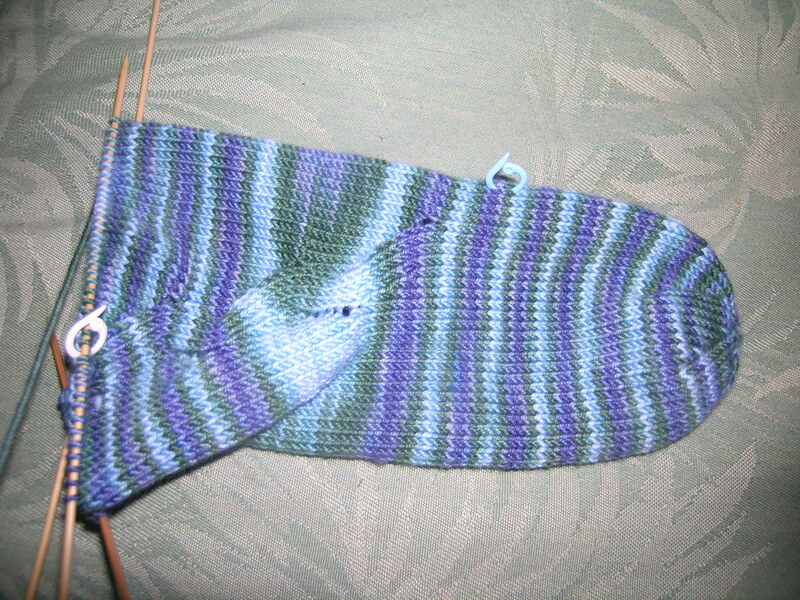 This is the January STR 2008 socks (I think). In my quest to knit all of these up, this was next on the list. The pattern was easy, almost mindless in fact. That made for good car knitting while we took my son to register for college. 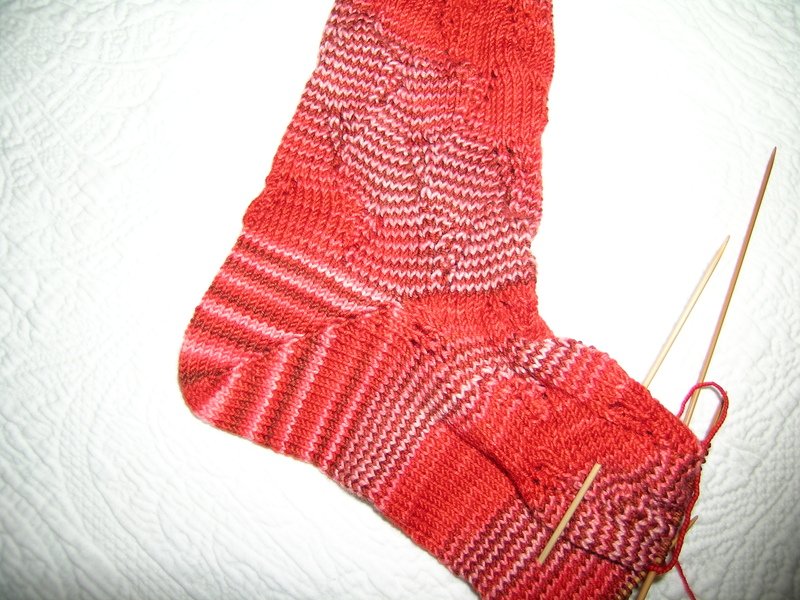 I finished one sock, measuring as directed, and checking gauge. When I was done, I felt I needed to rip it out. I kept trying to justify keeping it, and who could wear it. But then, I finally came to the realization that I did not know any NBA basketball players, I ripped it out. THEN I checked on Ravelry, and found that most everyone was having the same problem. Luckily they reknit fairly quickly. Seems like they are not test knitting their patterns very well. I did learn a couple of new techniques. Most interesting Judy’s Magic Cast-On (www.persistentillusion.com). I liked the way that it was applied to the toe, and think that it would make the perfect top for a hat. To review how to cast-on, I watched Cat Bordhi’s video on YouTube. I guess that it might be amusing if I were 3 or 4 years old. Personally, my needles don’t talk to each other while I am knitting. Cat Borhdi did have an improvement on the W&T that I blogged about earlier. She wrote it as follows:For a knit st, bring yarn to front between needles, slip next st knitwise, move yarn to back between needles, slip st back to left needle, and turn. For a purl st, bring yarn to back between needles, slip next st purlwise, move yarn to front between needles, slip st back to left needle, and turn. To conceal the wrap on a subsequent row, move it to the WS before knitting or purling it together with the st it wrapped. On the RS for a knit st, lift the front of the wrap over the st it wrapped, and drop it behind the needle on the left st. Now knit the st and the moved wrap st through the back loop (if you forgot to slip the st knitwise when wrapping, simply turn it around prior to this maneuver). On the WS, for a purl st, lift the back of the wrap over the st it wrapped, and drop it in the front of that st on the left needle. Now purl the st and the moved wrap together. I am not particularly fond of the rounded toe. I do not know anyone who has a foot shaped quite like that. All the same, when I did finally finish up the socks (with the ripping back I knit enough for 2 pairs) they were comfortable. Just kind of boring, not really worth the effort. Cat did an elaborate explanation of the waves on the sea as her inspiration for the socks. It really doesn’t come out at all. Another gift pair of socks. 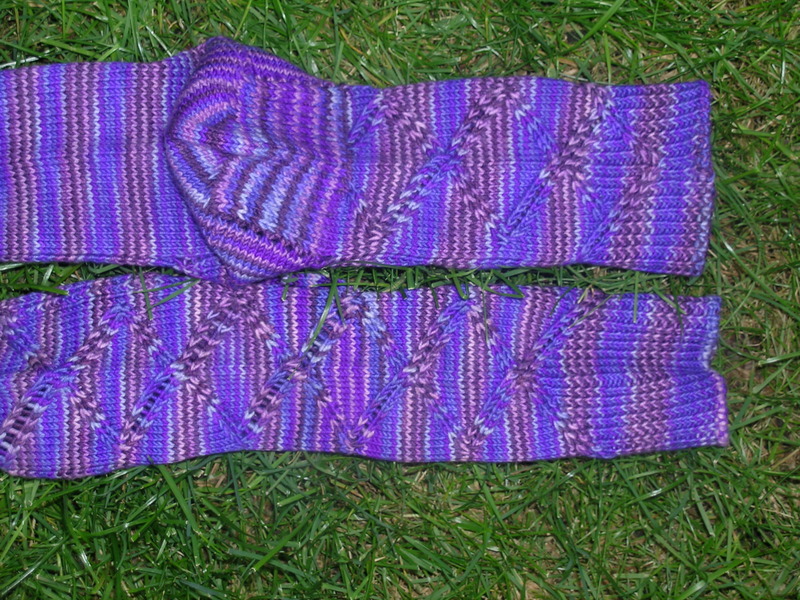 I finally finished Cleopatra’s socks!!! I felt like it took me 2 months do knit them up. Was it that my life has been so hectic lately, or was it because I had so many problems with the pattern, and the way that it was written? I did discover a couple of new techniques that I had not used before, in particular the way that the instep was created. 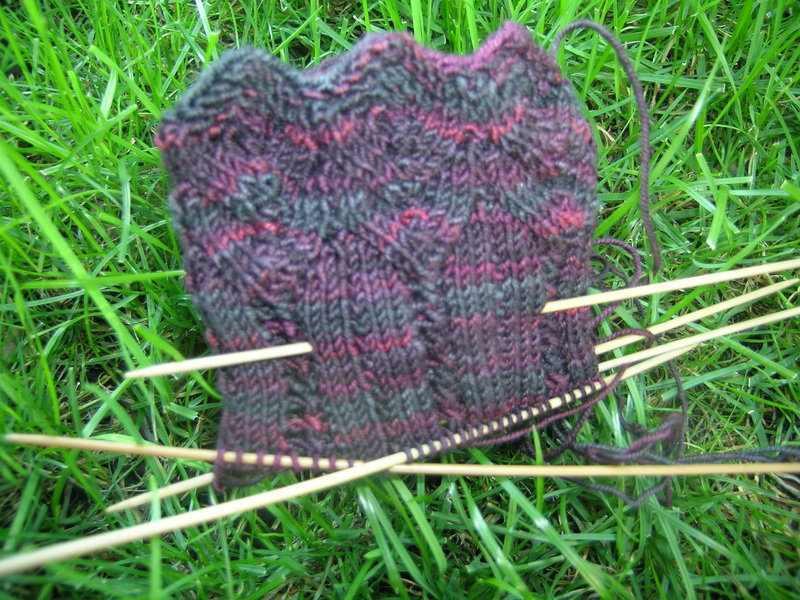 One of my problems with the toe-up sock is that the instep is usually very tight and it is difficult to extend it. I also like the structure of a top-down instep, it feels very tailored. This sock gave that feeling. I did have trouble with the left leaning lace section. No matter what I did, it was always noticeably looser than the right-leaning one. I finally came upon the solution. I the traveling stitch and the K2tbl, but did not do the yarn over. On the next row, I picked up the loose yarn between where the YO was suppose to be and created it just prior to using it. This allowed for a tighter cinch than I was able to get otherwise. Then the cuff…. The first problem is in the instructions, no photo and very obtuse directions. I do not understand why this could not have been charted also. Thank goodness for Ravelry where I could see what the back of the sock looked like. If you followed the instructions and not the photo, you would have ended up with a very short sock. Up to the point of the twisted rib cable for the cuff, the sock was fitting very nice. The instructions stated that if you wanted a loose cuff to go up a size, and since it was fitting well, I stayed with the same size needle. I finished off with a tubular cast-off to give lots of stretch. And, the cuff is way too tight. I have to pull to get them over my heel. 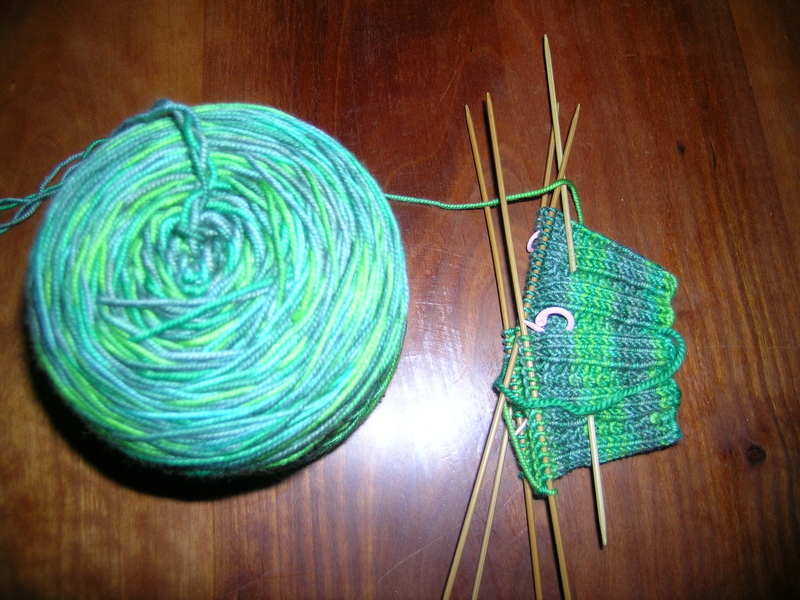 I did knit the second sock before casting off the first, and was able to use almost every inch of yarn. I am not sure that I want to rip back and redo the cuff, I think that I will just find a recipient with thin ankles. Not a pattern that I would recommend or knit again. I started the latest STR socks this past weekend. Initially, I thought that I would rip the sock out and make something totally different. However, even though I have some issues with the pattern I am persevering. I have a problem with the cross-over lace pattern, it is looser on one side than the other. When I look at other people’s photos, it seems to be a universal problem. I was curious about how the back works with the front pattern, and good for me too, as when I went online that was a common issue. There is a photo posted online, which should have really been in the instructions. I will post the photo when I have them completed. I really want STR to work on how they lay out their patterns, even if you like them, they are very hard to follow. The charts are scattered throughout, and they feel the need to write out each chart (separate page please), which just gets in the way. This is a 12 page pattern!!! I took my cat to the Vet’s yesterday, he is looking really bad. Lost about 3 pounds in a week, and is all skin and bones. I want him healthy and happy, but he is 16 years old. I just can’t see spending thousands of dollars on a pet. He was on IV yesterday, and is there since 8 this morning on IV’s also. He was so dehydrated that they could not get a good blood sample. They were going to do an ultrasound, they think that it might be his liver again. How do you know when to say enough? 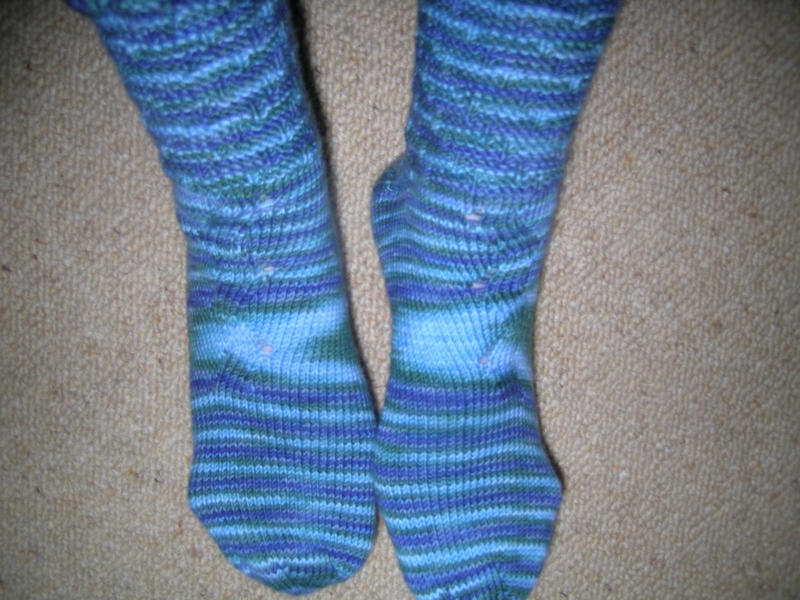 I finished the Serendipity socks from the STR 2008 club. Not a fan at all of their patterns or the way that they are written. I am just trying to knit each sock, and hopefully come up with some new techniques in the process. I will say that this one fit well, and I have a high instep that does not usually work with the short row heels. 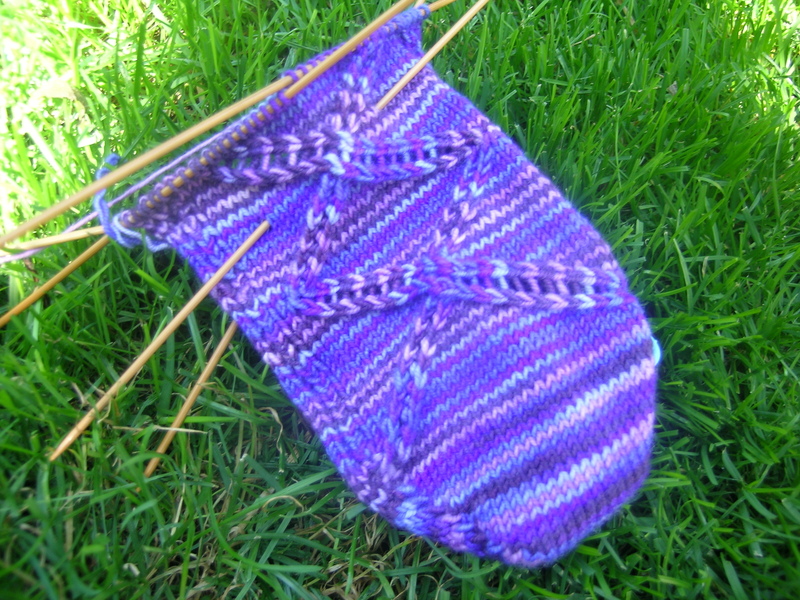 I might repeat this heel (with my version of the wrap and twist of course) on a future sock. I feel that knitting them all up is my penance for purchasing the club again after being less than satisfied with it last year. I have a lot of CookieA patterns that I want to make, but need to finish these first. Well, I have to give my daughter her space now. 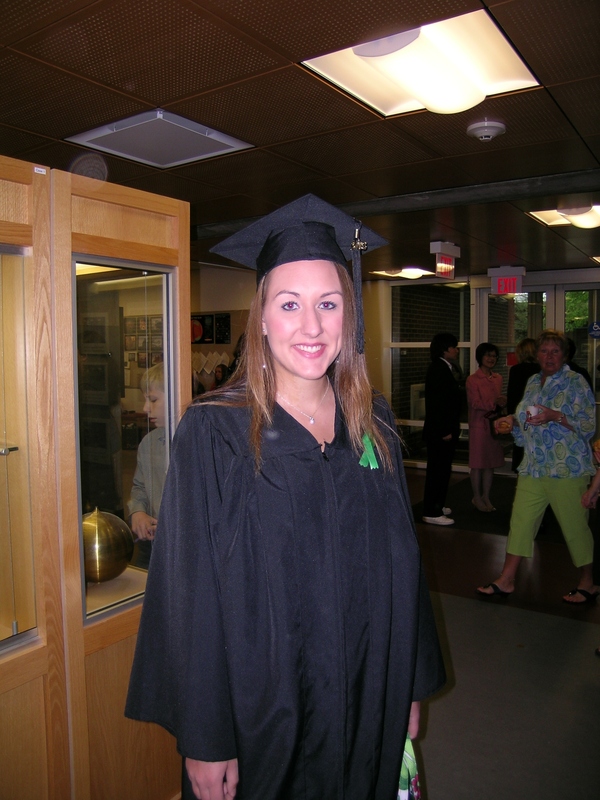 Sofia graduated from Grinnell College (very small, very good liberal arts college in Grinnell, Iowa) on the 19th. What started out to be a rainy dreary day, turned beautiful. The clouds parted, and the sun came out just as the ceremonies were about to start. Which was a good thing, as they kept them outside, and it lasted over 2 hours. Going to a small college means that every graduate gets called up by name (as opposed to my alma mater, the University of Michigan where they call out for all of the liberal arts students to stand up and thousands do so). Hard to believe that she is over with this part of her life. We get her back home, at least for awhile as she enters grad school. The main speaker at the graduation was Judith Butler, a feminist and anit-war activist from Berkley. Let me just say, that if either of my kids had turned in a paper as poorly written as her speech, it would have been given back to them. It was very depressing, delivered in a monotone, and I lost count of how many words she added “-able” to the end of. The day was saved by the honorary degrees, the best being a reporter for the Des Moines register, Rekha Basu. Her words were relevant, poignant, and eloquently delivered. She is now a syndicated colomnist, and I need to read her work. This is the link to an edited version of her speech. Here are the Serendipity socks also. They actually fit nicely. I don’t usually like the short row heel, as I have a high instep. Probably the lace is helping. I totally agree with you about Judith Butler. People say she’s brilliant, and she may very well be, but I just can’t understand her. I had to read a lot of her stuff in grad school, and during seminar discussions about her work I’m not sure even the professor knew what Butler was writing about. 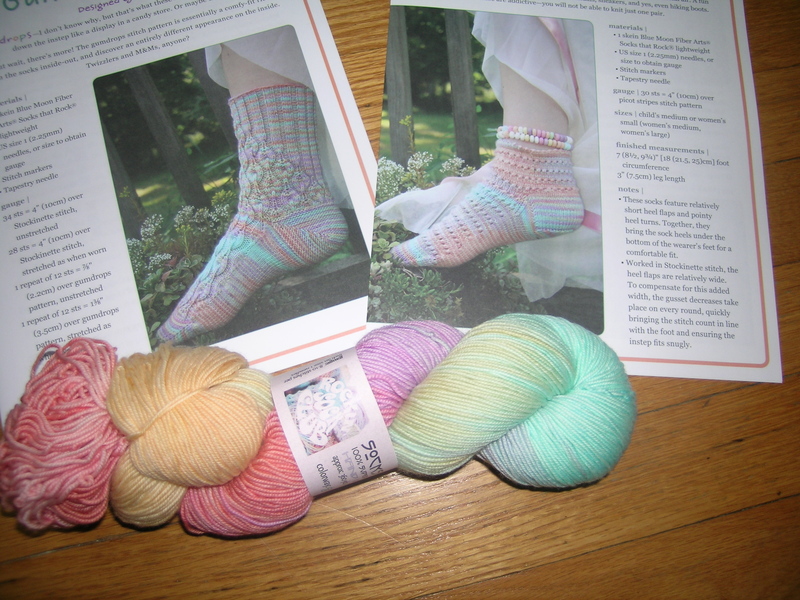 Well, I am making another pair of the languishing STR socks. The ones titled “Serendipity”, not sure that is an appropriate name for them. I am trying to look at these projects with an open mind, but having difficulty. I paid a LOT of money for the sock club. I was expecting good design. What I have gotten with one exception, is mediocre patterns, beautifully dyed yarns, and sometimes in weights/yarns I would not use. I thought that this would be a good opening to new ideas. Wish that I had saved my money for good yarn to knit all of CookieA’s socks. Here are my instructions for the W&T to eleviate the gaps and sloppiness on the heels. Continue the row either knitting or purling the next row as established. Be sure to tighten up the first stitch of the row to allow the wrap on the next row to be tight. This gives the same tight loop in either direction. The other problem with this pattern is that a gap appears when you start the body of the sock again. 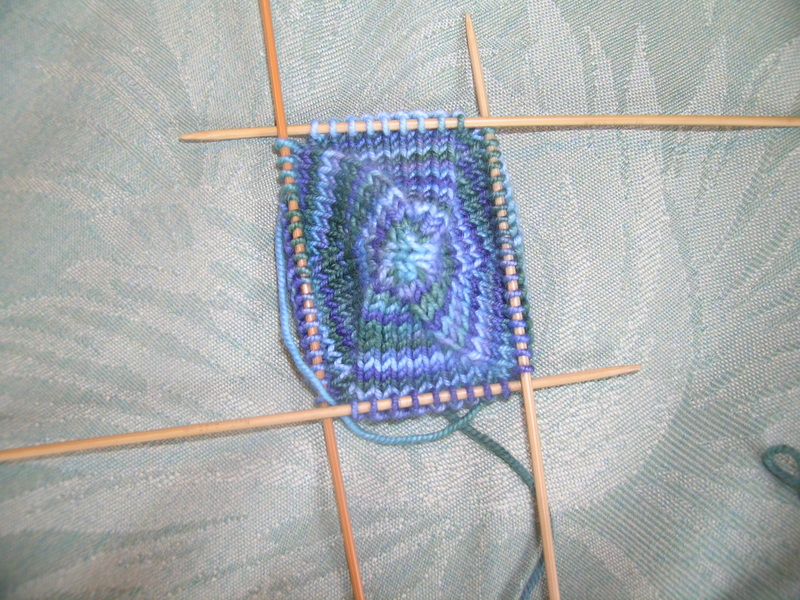 I had to go back and knit the stitch at each gap with the 2 wrapped stitches below, and it was a nice neat transition. I think that the lace pattern is weak at best. The heel extends 3 stitches into the lace area. And, can I complain more… the pattern is written as if you were working on circular needles. If written for 5 double points, it would have been so much easier to understand. No wonder people have such a hard time with the patterns in this club. I hadn’t posted in a few days, as my son decided to “upgrade” all of my photos to Adobe Photoshop. While in the long run I think that it will be better, I was at a loss on how to work with my photo collection. I sat fiddling with the program for a few days. I think that I am getting the hang of it now. It has been a very busy week here. Our house is going to be on a house walk in June featuring small homes (we live in a 1913 Arts & Crafts Bungalow). Ethan graduates from high school in June, and we have his party. We actually leave for Iowa in the morning to see Sofia graduate from college. Hard to believe that the two of them are so grown up. With all of this, work is busy and I am trying to finish up projects. We are also having a lot of work done on the house. First the rain garden, then new oak stairs to the basement. Now we are having the back fence fixed (never a wooden fence again, the back and sides are falling down after too much investment in them), and recreating the paneling in the DR and columns that are between the DR and LR. The original columns were in the attic, and we are having them recreated as they needed a bit of work. I will order light fixtures and have glass shades made to put on them. Should really bring back the old glory of the house, thank goodness they did not tear out the built-in china cabinet. Prom was tonite, and Ethan was very handsome. 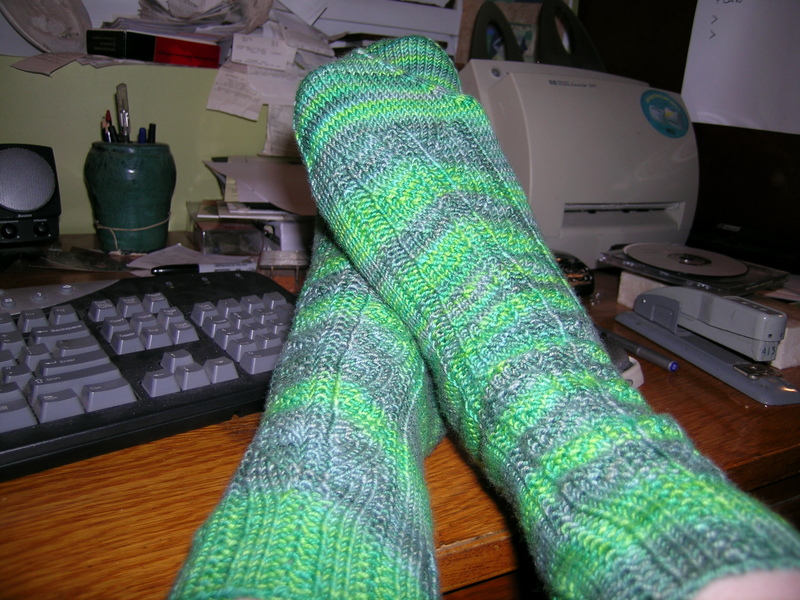 In spite of all this, I did get some knitting done, finished the STR March socks. The heel was a new technique that I had not tried, so that was interesting. I made them a bit small for my feet in order to give them away. They are good house socks, wouldn’t fit in a shoe. It is a bit frustrating that they barely give you enough yarn to do socks unless you are a small size, or have very short calf portion. I think that they should up the yardage on their yarn a bit. Well, I started on my March STR socks. I have 4 pairs of socks to knit up from this club, 2 from last year, and 2 this year. I thought that I liked the pattern and the colors. I am reminding myself again why I will not sign up for this sock club next year. The yarn is too bulky, lots of problems with the pattern and gauge is all wrong (even though I went down a needle size from the beginning. It shouldn’t be this hard. I worked just the cuff, I am going to have to rip it out and make the smallest size on size 1 needles for my big feet. What do people with small feet do? The yarn is a very pretty color however. I just don’t like the medium weight yarn. The socks don’t fit well in your shoes.